Not quite what you think of when cops are working together in a shoot out to catch the bad guy. However, maybe this cop has the flu and has the chills all of a sudden. It would be perfectly reasonable to expect that your cop partner would indeed cover you in a blanket. Or it could be a miscommunication. 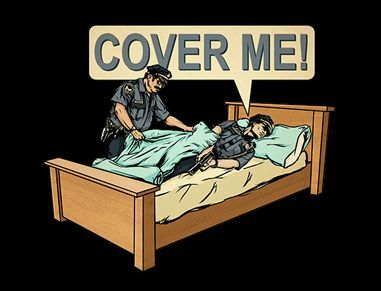 Cop is going to jump from the bed to get a better angle and wants some cover, but his stupid partner sees the blanket and decides to put that on his partner instead. What do you think is happening here? Whatever it is, it’s kinda funny.